If you are looking to boost product sales in a retail store setting, one of the best strategies is to go off shelf. By “off shelf” we mean getting your product placed somewhere in the store that is not on a standard gondola or “in-line” location. Your product has a better chance of getting noticed if it is in an off-shelf location. In-line products often blend together, and merchandising opportunities are more limited, making it more difficult for your product to stand out. Floor displays represent the biggest opportunity for off-shelf placement since counter space if often limited, particularly in small format stores. This is the first post in a 3-part series on floor displays. Over the course of the series, our goal is to simply share a wide range of floor display options with the hope of generating a creative spark for your next POP display project. There are many different kinds of floor displays- from floor shelf displays to grid displays to spinning tower displays and multi-product merchandisers. Similarly, there are upscale floor displays and economy floor displays, along with a wide range of material choices including metal, solid wood, wood composite materials like MDF and many more. To keep you on your toes, we’re purposely not going to categorize the display examples highlighted in this series. We’ll mix things up. By the end of the series, you’ll have been exposed to a fairly wide range of floor displays. So, let’s get started with the first 10 examples we’ll cover in today’s blog. Our first example is a very simple 1-sided solid wood floor shelf display. This display features a CNC-routered base, 5 fixed wood shelves, a solid back panel, and a framed header sign. This type is display is great for boxed products. It’s natural, durable and relatively cost-effective for a wood floor display. Our second example is a very similar solid wood display we made for Wood Underwear. The main difference is it is 2-sided. It’s a clean, natural look and does an excellent job complementing the product which is also made of wood. In addition to the header graphic, we used small logo accents on the base and sides. Our third example is designed to show a floor display that is all about loud branding. 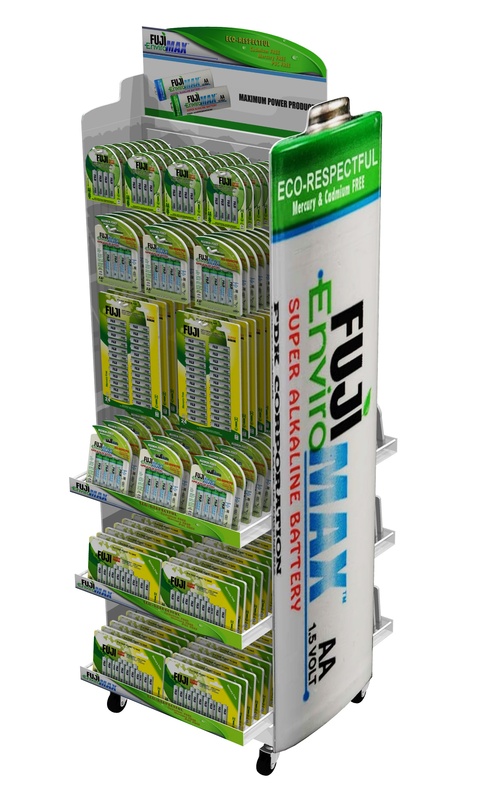 The 2-sided floor display shown below is one we designed to merchandise Fuji batteries. Its graphic intensity does a good job of disguising what is really a simple metal floor display. 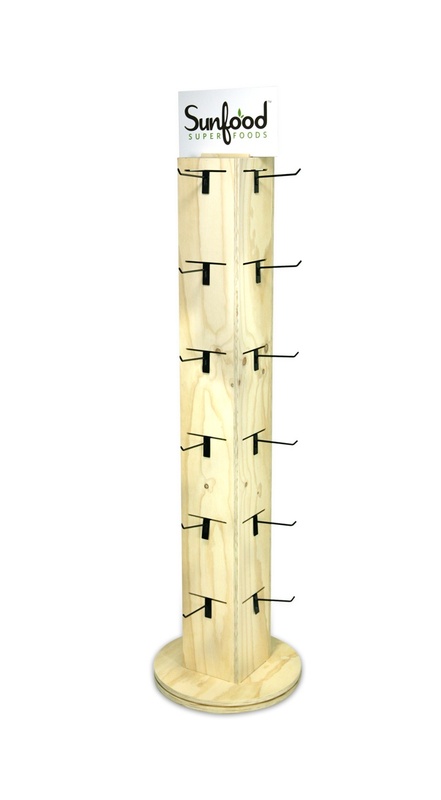 It includes 3 shelves on each side as well as hooks for hanging product. In addition to shelf signs, we added die-cut side and header signs to make sure Fuji branding was front and center. The Zone Perfect display shown below is another example of a metal display that can be dressed up by adding die-cut side and header graphics. Except for the graphics, this display is actually very minimalistic with respect to materials. It uses a simple metal tube frame and angled wire shelves. This floor display has a small footprint and knocks down for cost-effective shipping. 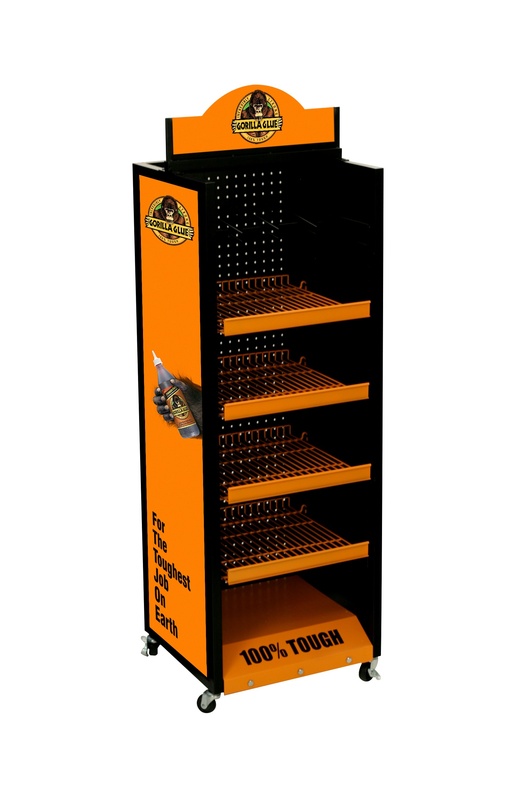 Our fifth example is a 1-sided mobile floor display we designed for Gorilla Glue. This is the type of display you might see in a Home Depot or independent hardware store. Like the two previous examples, this display utilizes a metal tube base, but what’s different is it has a pegboard back panel which creates a lot of flexibility for hanging products. Its bold orange and black colors make it stand out in a retail setting. The frame is powder coated black, but the shelves have a custom orange powder coating. We also designed a metal base plate with a screen-printed logo. The display includes digitally printed side and header signs. 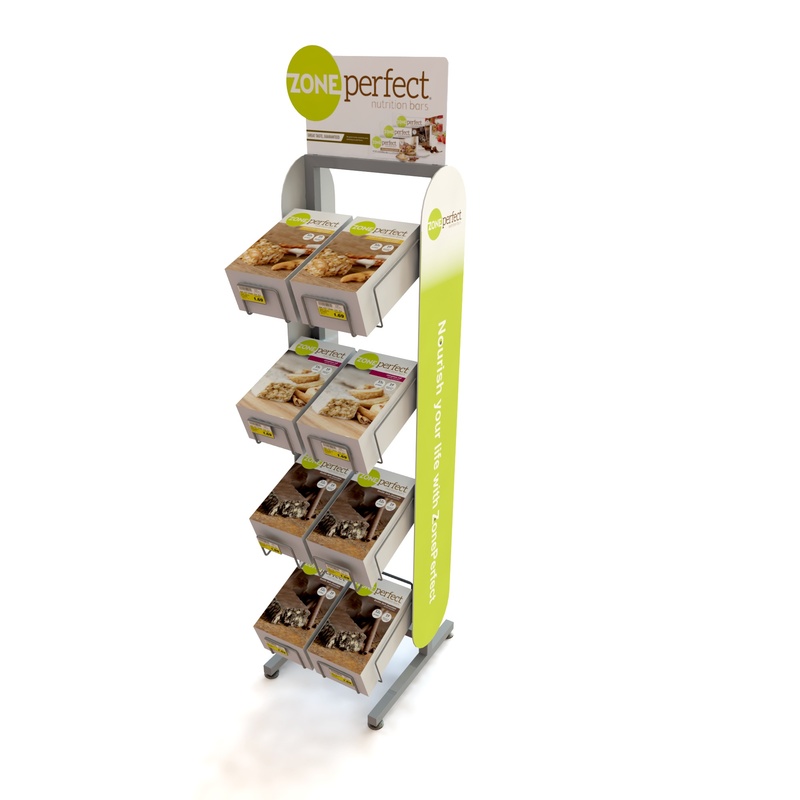 Sixth, we designed the wood tower display below for Sunfood. It’s a 4-sided merchandiser with fixed hook locations. We used plywood and left it raw to help reinforce the natural aspects of the Sunfood brand. This display has a small footprint and can be made to spin. We added a simple header sign printed on 2 sides. Our seventh example is another floor hook display but quite different than the Sunfood display shown above. This is a very economical metal floor display with a metal tube base, a 2-part metal pole, 3 rotating hook spinners, and a circular metal header screen printed on 2 sides. 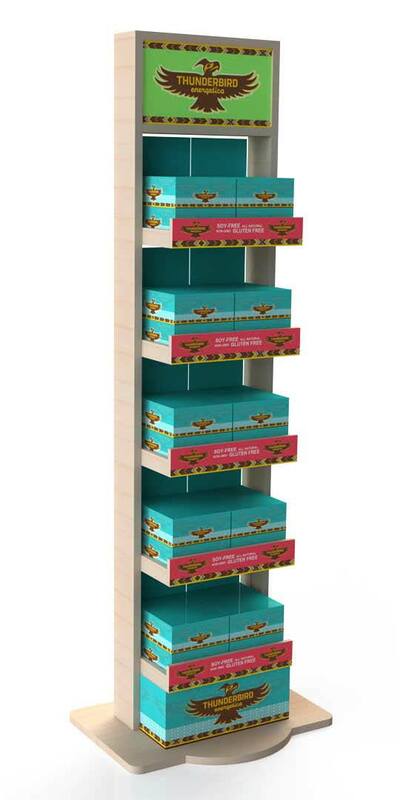 While we are on the subject of economy floor displays, the knock-down, fold-out wire floor shelf display is one of the most cost-effective options available for a floor shelf display. There is nothing fancy about this, but it does hold a fair amount of product and includes a sign holder for a basic header sign. It folds flat for shipping and could be made to accommodate side signs. This display won’t be winning any design awards, but if you are on a tight budget, this type of display is worth considering. 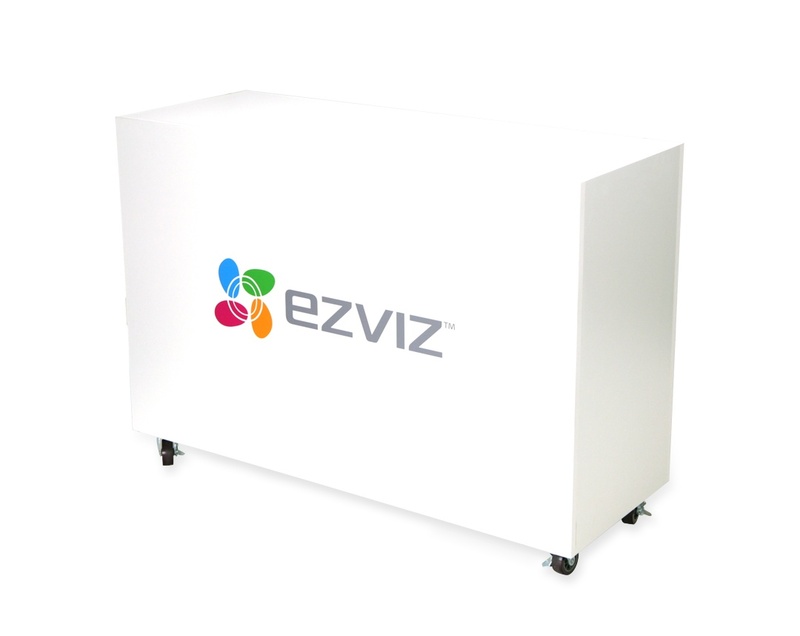 The EZVIZ cart display shown below is something we wanted to show in the category of floor displays simply because it provides an example of a mobile freestanding base platform that can be used in a lot of different ways. This particular unit was designed to go into an independent electronics store. 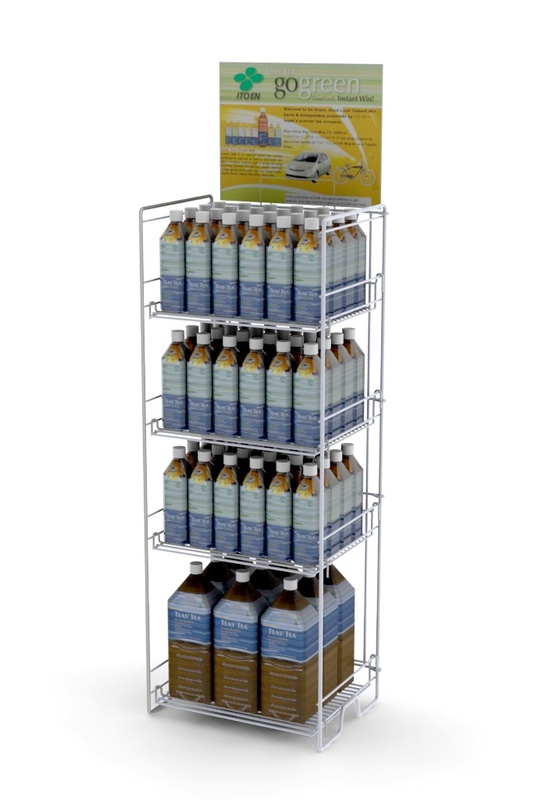 The cart can be used to promote your brand as well as providing a platform to hold one of more counter displays. It is similar to the way podiums are used in a retail environment. We designed the cart to have a monolithic look, but it would be easy to add doors on the cart with inside storage for greater utility. 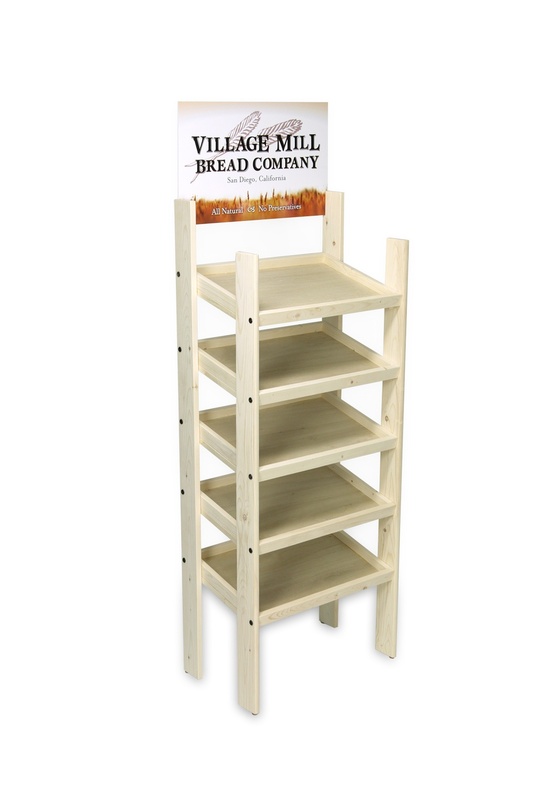 Our final example today is a solid wood floor shelf display we made for Village Mill Bread Company. In this case, the customer was looking for a display with a natural look to merchandise loaves of bread, but this display could easily be used to display many different kinds of products. We created the display with 5 slanted shelves and a PVC header sign. Stay tuned for Parts II and III of this series in which we will share 20 more examples of different types of floor displays.